Hey check it out, a big gaming publisher appreciates you for buying games from them. What a surprise. Today's top deal makes it clear there's no point buying AAA titles at full price (at least during release month). Origin just launched their "Player Appreciation Sale" with up to 70% off 200 titles. Funny enough, the sale was just called the "Origin Spring Sale" during the advance email notice we received last weekend, but now its all about EA player appreciation. Now, not everything in the EA sale is jaw dropping, but there are a few deals in this post worth noting. Perhaps the hottest deal is last month's release Crysis 3, which dropped to $29.99 with free shipping on Xbox 360, PS3, and PC. That's a new low by $10 and essentially half price for a big title. Dead Space 3 also dropped to $29.99. Solid price considering it launched only one month ago (February 19th) and has received a respectable 4 out of 5 rating on The Escapist and an overall 78/100 rating on Metacritic. Groupon has a sale on DMC: Devil May Cry, $34.99 for the Xbox 360 and PS3. That's the lowest price by $13 since its January 15th release. The next best price online is Amazon for $48, but elsewhere the game is $50-$60. Since the November 18th release of the Wii U, we haven't seen a whole lot in terms of discount prices or bonus offers. But this week, Target.com is offering a bonus $50 gift card with the Wii U Console 32GB Deluxe Set (includes Nintendo Land), essentially netting you an extra free game. This week GameFly has a "Spring Break PC Sale" with up to 75% off select PC downloads. Every day GameFly refreshes their batch of deals. Check out the full list here. Most games are either at or near their all-time lows. For example, Hitman: Absolution is $12.50 (list $49.99). The previous low was a few weeks ago in a 24 hour sale for $10, but normally the game sells for $30 and up. This week Humble Bundle introduced a "weekly sale" feature, with individual titles up for grabs instead of only bundles. For today, they have the popular action RPG Bastion on sale for a $1 minimum purchase price. Pay more than the average and you'll receive extra goodies such as soundtrack, art work, and ringtones. Crysis 3 (Xbox 360, PS3, PC Download) - $29.99 at Origin. Next best is $55 at JR.com. Deal expires March 26. Dead Space 3 (Xbox 360, PS3, PC Download) - $29.99 at Origin. List is $60. Deal expires March 26. DMC: Devil May Cry (Xbox 360, PS3) - $34.99 at Groupon. Next best is $48 at Amazon. Deal expires March 20. List is $15. Pay more than average = digital goods. Pay $25 for physical goodies. Wii U Console 32GB Deluxe Set - $349.99 at Target. Bundles with Nintendo Land and bonus of $50 Target gift card. Deal expires March 23. Lots of games on sale at up to 75% off. 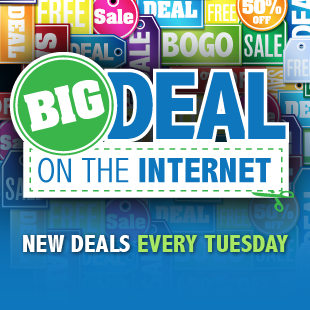 New deals everyday until Friday. Assassin's Creed 3 (PC Download) - $34.99. Next best is $50 at GameStop. Deal expires March 26. FIFA Soccer 13 (Wii U) - $29.99. Battlefield 3 Premium Edition (Xbox 360, PS3, PC Download) - $29.99. Includes the Battlefield 3 base game and premium content. Next best is $58 at JR.com. Deal expires March 26. Command & Conquer The Ultimate Collection (PC Download) - $14.99. Next best is $30 at GameStop. Deal expires March 26. The Walking Dead Game (PC Download) - $10. Next best is $25 at GameFly. Deal expires March 26. Mass Effect 3 (PC Download) - $9.99. List is $20. Deal expires March 26. Max Payne 3 (PC Download, Xbox 360, PS3) - $14.99. Hitman: Absolution (PC Download) - $12.49. Next best is $40 at Green Man Gaming. Deal expires today. Sid Meier's Civilization V: Gold (PC Download) - $13.60. Next best is $50 at Steam. Deal expires March 21. This is a good price but it should be noted thatGameFly will have it for $12.50 on Friday, March 20th. Kingdoms of Amalur: Reckoning (PC Download) - $7.49. Next best is $30 at GameStop. Alien Spidy (PC Download) - $6.80. List is $10. Deal expires March 22. Shattered Haven (PC Download) - $6. Bulletstorm (PC Download) - $4.99. The Walking Dead: Survival Instinct (Wii U) - $37.49. List is $50. Game released today, March 19th. Cars, Jets and Dirt Bike Pack (PC Download) - $14.99. Next best is $28. Deal expires today. Games activate on Steam. Skylanders Giants Starter Pack (PS3, Wii) - $39.99. Next best is $55 at Best Buy. Skylanders Giants Starter Pack (Xbox 360, Nintendo 3DS) - $54.99. Next best is $63 at JR.com. Deal expires March 23. Far Cry 3 (PS3, Xbox 360) - $29.99. Next best is $57 at Overstock.com. Deal expires March 23. Kingdom Hearts 3D: Dream Drop Distance (Nintendo 3DS) - $19.99. Next best is $33 at Amazon. Deal expires today. Pokemon Rumble Blast (Nintendo 3DS) - $9.99. Next best is $34 at Target. Deal expires March 23. Saints Row The Third (PS3) - $9.99. Next best is $31 at Amazon. Deal expires March 23. Dell XPS 8500 + 23" LED Monitor - $839.99 at Dell Home. Specs: Ivy Bridge Quad Core i7-3770, Radeon HD 7570, and 8GB RAM. List is $1,175. Deal expires March 20. Samsung Series 7 Gamer Laptop - $1,399 at Microsoft. Model NP700G7C-S02US, specs: Core i7-3630QM, 1GB RAM, 1.5 TB 7200RPM HDD + 8GB SSD, GeForce GTX 675M, and Blu-ray. Next best is $1,600 at NewEgg. PlayStation Vita 3G / WiFi with 8GB Memory Card - $249.99 at Sony. Next best is $280 at Walmart. Logitech G510 Gaming Keyboard - $49.99 at NewEgg. Next best is $95 at Amazon. Deal expires March 24. PlayStation Vita 16GB Memory Card - $29.99 at Best Buy. List is $60. Gotta love the extra plastic parts making this Vita-only.